Wow everybody! We're into the 4th week of Roger's Creative Photography Contest. 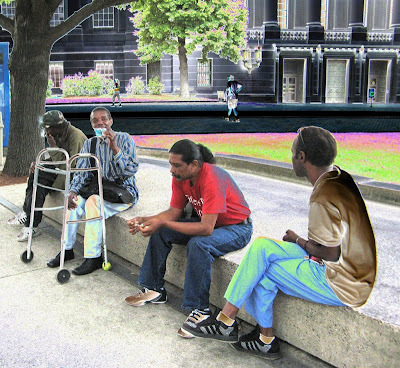 These fellas were sitting outside the Christian Science Center in Boston this weekend. I noticed them because they were there in stark contrast to the huge, great complex of the Center designed by I.M. Pei in 1968. The man second from the left, the one with the walker in the photo, spoke and asked if I had anything to offer them for a bite to eat. In the photo he's showing me his identity tag which said he belonged to an organization for homeless and hungry men. After I took the picture above, with permission, the gentleman stood up and walked toward me so that I could see his tag up close. I gave him all the singles I had in my bag, about 5 or 6. He thanked me and went to sit down when the man on the far left who was smoking a cigarette spoke angrily and said, "How about me, ma'm, I'm hungry." I said to the man I gave the money to, "Hey, aren't you going to share that money?" But smoking man shouted "He's not going to share it!" I repeated, "You have to share the money. You can't keep it all." And I stood there. Slowly the man gave two of the dollars to smoking man. "Good," I said and walked away. The other men (red shirt; blue pants) said nothing and never looked at me during the entire exchange. I posterized it to add color, and lightened it a bit. Interesting photo and accompanying story. I like how you posterized it. Great effects Mary! Thank you for your Creative Photography submission. What an amazing story begind a fascinating pic! It certainly makes us all grateful for what we have. Even if it doesn't seem much to us, (because we struggle from pay day to pay day,it is more than these guys have! That's a very sur-real image and interesting story to match. I've often thought of snapping some city picts and buying coffees or burgers to those who participated in my photos. Way cool. Love the effects. Good luck in the contest. That's a great pic and a great story! What a great story! lovely shot and nice effect! I love the building and the way the color plays across the lawn. It added such detail without taking away from the main subjects who were clearly colorful in their own way. Congratulations Mary!! 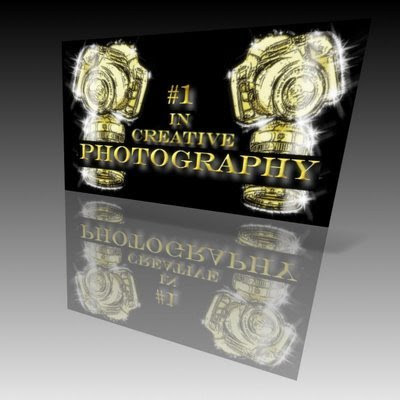 Your this week #1 in Creative Photography, great job!! Come on by and pick up your award!! I really loved the story embedded in this pic when I first saw it! Congratulations! A well deserved win... you had my vote! I loved that photo - such a story, a great scene, it was worth a thousand words as the old saying goes! 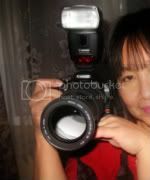 Great creative use of your photography!